Examine the challenging environments inside a health-care facility with attention to the need for durability and cleanability as well as advanced antimicrobial qualities. Discuss the move away from visually sterile health-care environments toward attractive and comforting design. List various stations in a health-care facility and the ideal coordinated surface product specifications for durability, cleanability, harmony, beauty, and microbial resistance. Explain testing, standards, and certifications that ensure hard-surfacing products are safe and appropriate for demanding health-care settings. Review several case studies that demonstrate various surfaces within health-care facilities that marry form with function. In every health-care facility, several wars are being waged. First and foremost is the battle against disease, executed by science, medicine, and human efforts. But another battle is simultaneously being waged, and that is a battle between sterility and design. It’s true that a glistening white environment of sterile hard surfaces may look laboratory clean. But such an aesthetic ignores the very real human need for comfort and beauty in the healing process. The antiseptic aesthetic might radiate confidence in the cleanliness of the facility, but such starkness devoid of warmth can cause anxiety in patients, their families, and even the staff. The goal for the designer of a health-care facility should be specification of surface products that fulfill four criteria: cleanability, durability, microbial resistance, and healing aesthetic. In a health-care setting, surfaces need to be cleanable, durable, microbial resistant, and imbued with a healing and calming aesthetic for the patients, their families, and staff. It’s easy to see how the quest for sterility could supersede the need for a calming aesthetic. The number of infections acquired by patients in health-care settings has reached alarming rates. These are referred to as health-care-associated infections (HAIs). 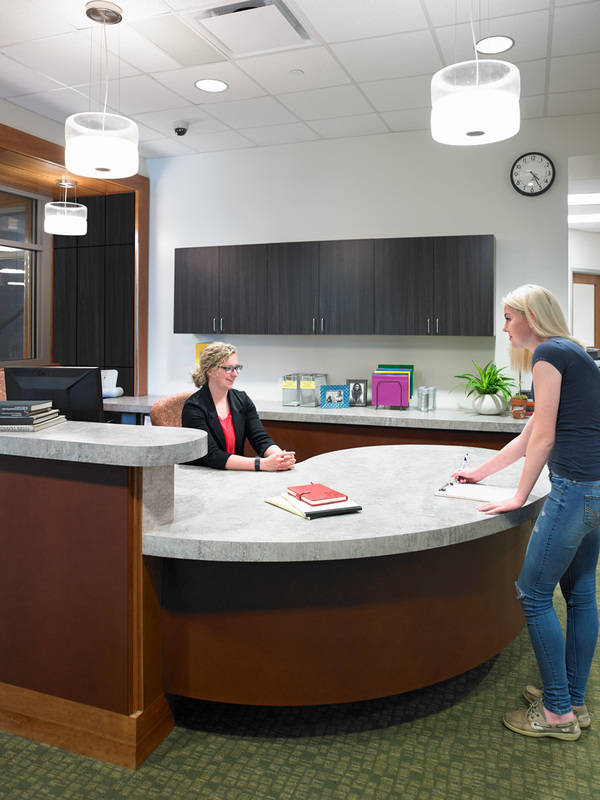 Reception counters and other areas in a hospital, clinic, or medical office are touched by multitudes of patients, families, staff, doctors, delivery people, and others throughout the day. According to the Centers for Disease Control (CDC), on any given day, about one in 20 patients has at least one HAI, and more than 1 million HAIs occur in the health-care industry every year.1 Hospital-acquired HAIs alone are responsible for $28 billion to $33 billion in potentially preventable health-care expenditures annually. Scientific evidence has shown that certain types of HAIs can be drastically reduced to save lives and avoid excess costs. 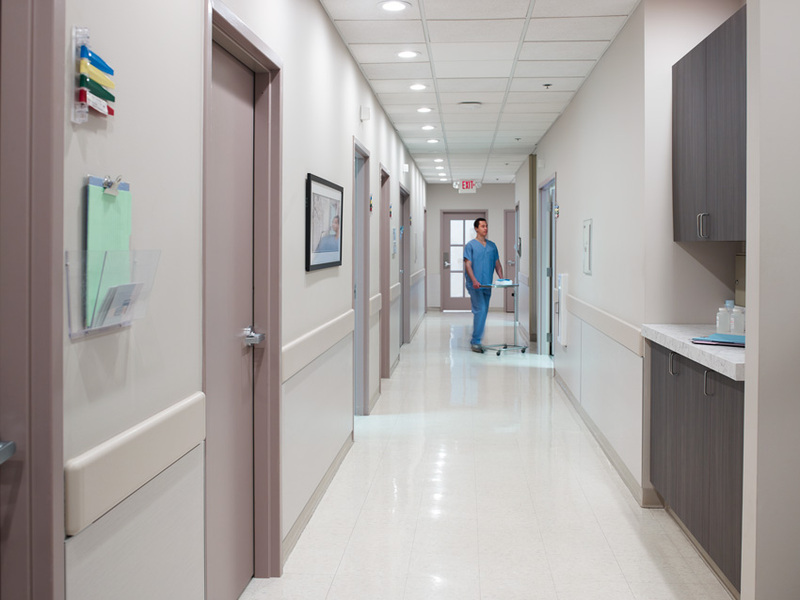 And so when a health-care facility designer or specifier studies the literature to determine best practices for safety, there are literally hundreds or thousands of references to the need for scrubbable, cleanable, sterile surfaces—which might lead to a sterile aesthetic. Besides infections, health-care facilities present other challenges for the designer. Consider the traditional hospital hallway or corridor. In a typical day in a busy facility, patients on gurneys might be rushed along the corridor into emergency surgery. Large hospital beds connected to IV stands might be moved along the corridor. Nurses with carts move up and down the hallways. It’s easy to imagine the walls getting bumped into many times a day. Thus, the walls must not only be cleanable but also durable. Keeping a health-care facility free of infection-causing microbes is of utmost importance. Contamination of surfaces is a major contributor to health-care-associated infections. And consider the multitudes of people coming in and out of the facility every day, including patients arriving and being discharged, family members and visitors, delivery people, plus doctors, nurses, and other staff members. Each potentially brings into the facility infectious microbes that can linger on any number of surfaces, from the intake counter to the restroom counter. With all this information about the need for durability and safety in health-care facilities, the designer may tend toward a sterile aesthetic. But there is more to healing than a clean surface. There is the human factor.